The Gold Coast is one of the most versatile destinations for visitors from all over the world. Activities to suit all age groups and interests combined with a sub-tropical climate that boasts sunshine and enviable temperatures all year round makes the Gold Coast a must-see destination! 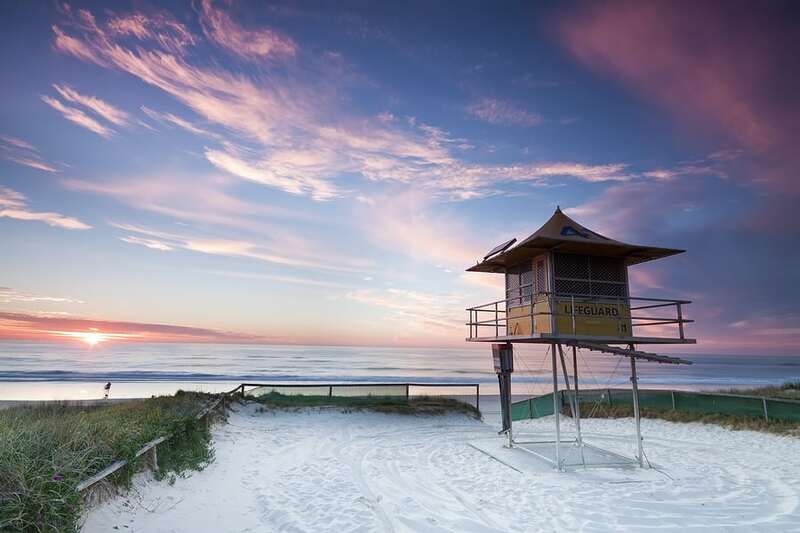 No one knows the Gold Coast like the locals, so read on for our top eight things to do! The observation deck on Level 77 of the Q1 Building at 9 Hamilton Avenue, Surfers Paradise, gives an eagle’s eye view across the Gold Coast. The Q1 is the only beachside observation deck in Australia, so it’s definitely worth the $15 fee to catch the 360 degrees views across the coast. Out to sea, you may even see whales depending on the time of year of your visit, and towards the hinterland, you’ll spot Mount Tamborine. There’s no need to leave in a hurry. Stop off at the SkyPoint Bistro and Bar on the same level for a buffet breakfast or all-day dining – the deck entry and meal combo cost $35. Why not relax with a cocktail or beer while taking in the views? Strung out along the foreshore near Cavill Mall at Surfers Paradise with views of the ocean are around 100 stall holders with art, photography, jewellery, fashion, homeware and beauty products on sale. Sample local wares and view artisans-at-work while live music adds to the atmosphere. The markets are open on Wednesday, Friday, and Sunday evenings, with the option of collecting Market Night Dinner Special vouchers from the Beachfront Markets marquee to use at one of the participating restaurants or cafes in Surfers Paradise after browsing. Hop aboard the 12m boat aptly named ‘Discover’ to experience the thrill of breathing underwater and hand-feeding the diverse marine-life that calls the warm Gold Coast’s water home. There’s no need to go through a three-day course as this PADI Discover Scuba Diving experience is for people who aren’t certified but would still like to experience the calm Wave Break Island Dive site. You can bring friends, either as spectators or to snorkel, on the vessel that departs daily from Marina Mirage, Main Beach. A certified PADI instructor will accompany you throughout the whole dive, enabling you to relax and enjoy the sensation of weightlessness while experiencing the fascinating aquatic creatures beneath the ocean’s surface. For up close and personal encounters with humpback whales, the small vessel takes a maximum of eight guests out to see the whales for around three to four hours. The smaller vessel means the whales are not intimidated and will remain around for longer. The outer tubes of the semi-inflatable vessel are just 50cm above the water surface which means you can submerge your waterproof camera as the whales pass by, making for some incredible underwater shots. The law says that no vessel is allowed to approach whales closer than 100m, however, when the boat engines are turned off, and the vessel drifts silently through the water, the whales will often come in close of their own accord. A visit to the Gold Coast isn’t complete without some surf lessons! There are many surf schools on the Gold Coast, but the Currumbin Alley Surf School https://currumbinalleysurfschool.com.au/ vehicle stands out in its position, parked at Currumbin Alley. They run surf programs for kids aged five to 14 years, aka the Frothing Grommets, as well as lessons for adults. Year-round lessons are held in the water that remains relatively warm even in winter. The 1½-hour lesson will include a warm-up, instruction on land, and then it’s into the water for the surfing experience on soft surfboards that are ideal for learning. Costs cover the use of the surfboard, instruction, wet-shirt or wetsuit. All they ask is that you bring a positive attitude – they’ll soon have you up and standing on your board! In line with the health culture of the Gold Coast, you can get great breakfast bowls with acai, fresh fruit, thin buckwheat pancakes filled with delightfully colourful and healthy fillings. Many cafés open up from the time the sun peeks over the horizon to serve the early-risers. You’ll be spoilt for choice, but one of our favourites is Niche and Co (https://www.facebook.com/nicheandco) at 449 Golden Four Drive, Tugun, open from 5:30 am to 1:30 pm. For a different scene visit Iron and Resin Garage (https://ironandresin.com.au/) in Currumbin Waters for great coffee and eats and to chat bikes and classic cars and perhaps buy some biker gear. Weekends are even more fun as families come together to listen to live music in the garden and check out the motorcycles, classic cars, and hot rods. The Sunday market is open from 6 am to 12 pm selling the freshest vegetables and fruit products that are all certified organically grown. It all happens at Miami State High School where there’s plenty of parking on the field virtually next to the market, so you don’t have to carry those piles of fresh produce too far! Check out the wholesome, gluten-free bread including sourdough and wholemeal, freshly made espresso coffee and teas, smoothies and freshly made juices as well as breakfasts. You can also stock up on spreads, dressings, chutney, pickles, dry goods such as grains, nuts and flour. Choose from a range of health foods, books on healthier lifestyles, safe cleaning products, and even dried pet foods! Like we said, something for everyone! Make your Gold Coast Hinterland tour as exciting as you want by choosing a 4WD rainforest tour, or an evening tour to the Natural Bridge Glow Worm Caves. Springbrook Mountain, a world heritage listed site, has one of the world’s oldest living forests and magnificent waterfalls. Historic Canungra Valley has land warfare countryside – a jungle training camp for soldiers today as well as courageous WW2 soldiers. Morning tea at the Alpaca Farm affords spectacular views of the McPherson Ranges and a chance to meet the alpacas. World heritage listed Lamington National Park, and O’Reilly’s Mountain are worth a visit, especially for the Tree Top Canopy Walk, a suspended bridge 160m long and 16m up, giving a bird’s eye view of the rainforest. At O’Reilly’s Vineyard, sample some of the area’s wines and relax creek side, before returning back to your beachside accommodation, or spending the night star-gazing in the heart of the rainforest. Between the green of the hinterland, the gold of the beaches, and the thriving café culture, the Gold Coast is filled with unique experiences that will leave you with lasting memories that will warrant a special place in your heart. Visit an untouched conservation park only a stone throw away from the busy Gold Coast and often overlooked as one of the Gold Coast’s beautiful attraction. Depart by boat with Sea the Gold Coast ex Runaway Bay Marina and cruise through Moreton Bay Marine Park. Spot wild birds, dolphins ad rays whilst heading to Currigee inlet. Once arrived on the island, enjoy untouched nature and walk across the island to the eastern beach. Spot wallabies and kangaroos and well as koalas. South Straddie is simply amazing and this tour will not disappoint you. This 2 hour visit will get you to where the locals usually hang out. Explore the hidden coast lookouts and enjoy spectacular ocean and skyline views. The tour passes by some quiet beaches and ends at Q1 Skypoint Observation Deck (entry included).